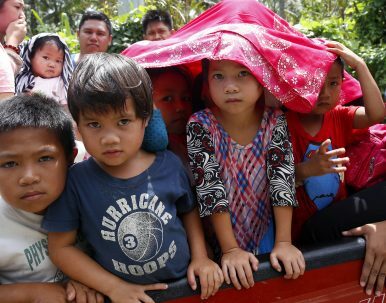 Children of displaced families gaze at a photographer while fleeing to safer areas as government troops battle with Muslim militants in Marawi, southern Philippines (May 29, 2017). Pregnant women and their newborns are among the refugees displaced by conflict in the Philippines. LANAO DEL SUR, Philippines — Seven months pregnant, Widad Batabor was bleeding profusely when she left Marawi City on her 28th birthday. It was May 23, the day President Rodrigo Duterte declared martial law in Mindanao, after the Islamic State-inspired Maute group took over sections of the city on the same day. “I just wanted to save my baby before the bombings get worse,” said Batabor five months after the attack, with four-month-old baby Bakwit in her arms. Batabor remembered how she left home that day. Except for the intermittent sounds of gunfire, she thought her neighborhood was quiet. But as she went out, she discovered that the streets were crammed with residents leaving their houses — elderly people in wheelchairs, pregnant women and children on their feet, and a long queue of stranded cars. It took hours to reach Saguiaran town, six kilometers away, where, along with the rest of the evacuees, they had a stopover before Batabor’s family proceeded to a relative’s house in Iligan City. “It felt like 10 years for me,” she said, recalling the 10-hour trip to Iligan City. Barely a month later, Batabor gave birth by caesarean section to a son she nicknamed “Baby Bakwit.” The baby came a month ahead of the expected due date. Batabor blamed her premature delivery on the trauma she went through as an evacuee. Her hospital bills, which ran up to P90,000 ($1,760), drained her savings, which could have been used as start-up capital. Batabor was just one among hundreds of women from Marawi who gave birth during the evacuation. She was a home-based evacuee (meaning those evacuees who took refuge in the homes of relatives), who made up 80 percent of at least 350,000 displaced residents from Marawi City and neighboring towns. In Saguiaran town, about 32 kilometers from where Batabor sought refuge in her relative’s house in Iligan City, 108 women evacuees gave birth at the evacuation center from May 23 to June 30. All the deliveries were normal, but the harsh living conditions at the evacuation site posed risks to the health of mothers and babies alike. Serving as a temporary emergency hospital to at least 5,700 displaced families, the Regional Health Unit (RHU) had an average of four babies born every day from May 24 to June 30. From July to September, 235 women came here for prenatal checkups. Women with newborn babies continued to recover inside their tents or spaces on the covered court and plaza. They lay uncomfortably on straw mats or used cartons as mattresses on dusty floors. They tried to protect themselves from splashes of raindrops and cold breezes at night by putting up ceilings made of plastic bags, which attracted so much heat during daytime. Mothers had only rice and canned sardines or corned beef from the relief goods to eat as they started breastfeeding. 213 lactating mothers were recorded from May 24 to June 30, but some of them later stopped producing milk. “It’s just psychological,” Rocaira Butawan, midwife of Saguiaran RHU said, explaining that women can lactate again as long as they drink enough water or soup. These women could access water from the tap, but they needed cash to buy ingredients for soup. Some mothers sold the donated canned goods or used the donated rice to cook hotcakes for sale just to earn cash to buy vegetables or formula milk. “We advised mothers not to use any formula milk, but only breast milk,” Butawan said. Hospital staff also told mothers who had delivered at the center to return for a monthly checkup, but Butawan said only about 60 percent of them actually came back. Those who returned availed themselves of free multivitamins and ferrous sulfate (an iron supplement), while midwives counselled them to help the new mothers start to lactate again. The Saguiaran RHU recorded 180 malnourished children from May 24 to June 30. The health center provides Vitamin A, multivitamins, ferrous sulfate, and Vitamix, a sachet of micronutrient powder for daily supplement, which will be mixed into children’s food, said Butawan. During the same period, 627 children less than 5 years old suffered from upper respiratory tract infections, which was the most common ailment among that age group. Another 419 children less than 5 years old were recorded as having fevers; 172 children had skin diseases. The humid atmosphere inside the evacuation centers contributed to their conditions, said Butawan. Nearly 1,000 individuals were squeezed into the covered gym, with only blankets to separate them. This makes it easy for diseases to spread. Some were housed under the people’s plaza, which is an elevated stage made of concrete. Public bathrooms were provided within the area, but poor sanitation caused the diseases, according to Butawan. The health unit provided ointment to treat skin problems, and advised parents to practice regular hand washing, and bathe their children and change their clothes every day. The Saguiaran evacuation centers were among more than 80 evacuation centers and tent camps in the provinces of Lanao del Sur, Lanao del Norte, and Misamis Oriental. The conflict displaced over 70,000 families in total. Relief assistance amounted to nearly $64 million, but evacuees complained about not getting enough, especially those living in relatives’ homes. While renting a room for $100 a month in her relative’s house, along with three other displaced families, Batabor received food packs from the Department of Social Welfare and Development (DSWD) in the first two weeks after the evacuation, but she got less and less as the days went by. She hated using up her savings to pay for rent and utilities. Some families having more than 10 dependents were forced to live with relatives in neighboring towns, as they were denied accommodation at the evacuation centers. They received the same amount of relief goods as families with less than six members. It was the same with the DSWD’s “cash for work” program — regardless of the number of family members, each family got $40 in exchange for 10 days of community work. The Marawi siege began on May 23, and, on the same day, the president declared martial law in Mindanao, which later he extended until December 31. The fighting killed more than 1,100 people, including at least 900 militants and 165 government forces. It destroyed the city center, which was part of what the soldiers called “ground zero.” Over 40 villages were ruined and it is estimated that it will be three years before the area is livable again. Despite the uncertainties, evacuees have been clamoring to go home due to poor conditions in the evacuation centers. They are also asking for work or capital to rebuild their shops, which the war had reduced to debris. Duterte announced the liberation of Marawi on October 17, a day after the reported death of Isnilon Hapilon and Omar Maute, leaders of the Abu Sayyaf and Maute group respectively. Following Duterte’s declaration, local government units opened areas in Marawi already cleared of militants for the return of displaced residents. But many residents prefer to wait until the cleanup drives are completed and basic government services are restored. When Batabor left her home, she did not bring anything because she thought she would be back after a week. With all her savings gone, without a livelihood, and without electricity in the house, she said she – and her young baby – could not yet return home. Lorie Ann Cascaro is a journalist from the Philippines.